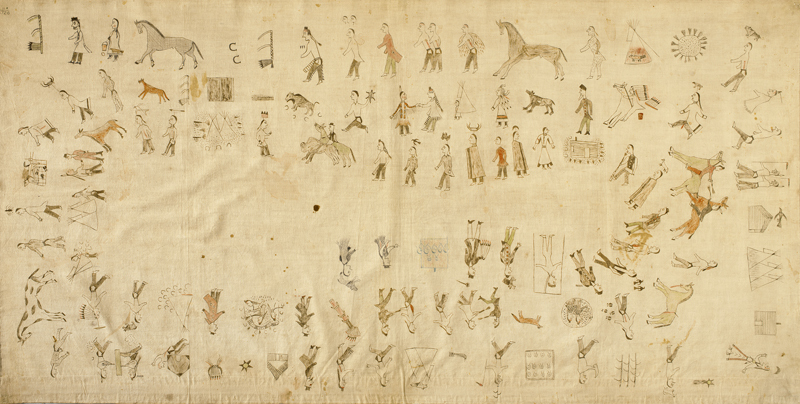 Winter Count | A Song for the Horse Nation - October 29, 2011 through January 7, 2013 - The National Museum of the American Indian - Washington, D.C.
A winter count is an illustrated history in which each year is represented by a drawing of an important or unusual event. This winter count begins in 1798 and ends in 1902. Horses appear frequently in the story, which starts at the upper left corner and moves clockwise to the center. 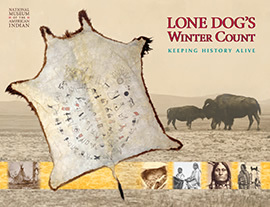 In the events recorded on Long Soldier’s Winter Count, horses often played an important role. This teaching poster, developed for 4th–8th grades, is 2' x 3' with a lesson plan and reproducible student activity sheets on the back. Students learn about the oral culture and history-keeping of the Nakota people, who made the Lone Dog winter count.